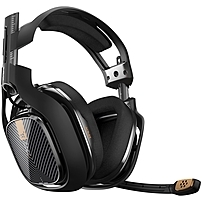 Astro A40 Tr Headset - Stereo .. The A40 TR headset arrives as an open back headset featuring amazing audio quality, long term comfort, a swappable precision mic and customizable speaker tags. For loud pro tournaments, you can transform the A40 TR to a closed back noise canceling headset by swapping components like speaker tags, microphone and ear cushions sold separately in ASTRO Mod Kits. All TR products are the Official Equipment of Call of Duty Black Ops 3 and are used by top Call of Duty Pro teams like Optic Gaming and Team Envyus.